photo: Emmanuel Siale had 16 points in the narrow loss to Edmonds. photo by Rick May. 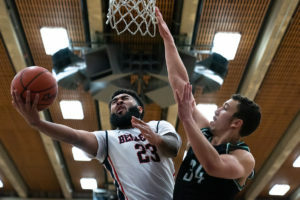 Although three-point goals don’t necessarily dictate the outcome of a game, but a 1-for-17 night from long range doesn’t forecast well for wins as Bellevue was upended tonight by Edmonds by a score of 83-79. In an otherwise evenly played game statistically across the board, the Bulldogs didn’t sink their first three-pointer until Kai Warren drained one with 32 seconds to go in the game. The shot was pivotal as it put Bellevue within reach at 80-76. With 15 seconds to go, Ting-Jhao Jian made a layup to put BC within two at 81-79. The quick foul by Bellevue’s Malik Sanchez put all the pressure on the Tritons’ Thomas Doyle, who promptly made both free throws to seal the win for Edmonds. Warren led Bellevue in a balanced scoring attack with 18 points. Curtis Walker and Emmanuel Siale each had 16 while Sanchez, who was a perfect 6-for-6 from the line and led the squad with five assists, added 14. Bellevue is now 2-3 (11-7 overall) and faces Olympic (0-5 / 4-14) this Saturday January 26 at 6:00 p.m. in a return home to Courter Family Athletic Pavilion.